If men are from Mars and women are from Venus, the cramped, plastic confines of an airliner are the native habitat of neither. But there are some things airlines and aircraft makers can do to accommodate the distinctive needs of both. “There are differences between men and women in physical dimensions, such as seated height, reach and hip breadth,” McEwan continues. So seat builders have to accommodate a wide range of potential sitters. Physical differences can also affect the user’s experience with windows, bins and lighting, according to McEwan. The new composite fuselages on Boeing’s 787 Dreamliner and Airbus’s A350 XWB allow larger windows. They let in more light, pleasing most passengers, while also ensuring a good view for a wider range of differently sized people. Boeing’s latest bins include latches that open by pulling up or down, suiting different people, and mirrors that let shorter people see if they’ve left anything up there. Many seats now have built-in steps to help with bin access. Putting light and fan controls in the seat also helps accommodate smaller people, male or female. The addition of storage space in business and first classes also creates the opportunity to ensure that spaces meet needs of men and women, notes Diego Kolsky, creative director and partner at MBLM. 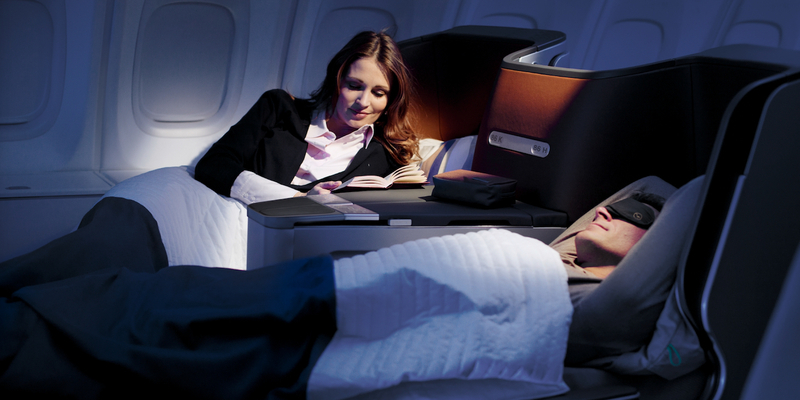 These days business and first-class cabins tend to focus on cocooning passengers from each other in posh pods. “The seats are designed specifically to separate and give private space to passengers,” Kolsky notes. 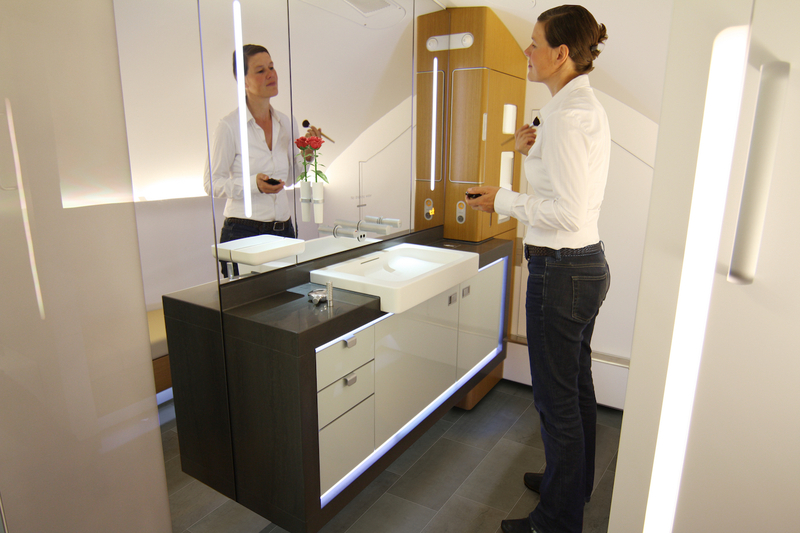 Kolsky doesn’t expect to see cabins designed specifically with gender in mind. “It’s all still driven by studies on who is the average passenger,” he said, adding that the idea is to “balance the elements so that nobody feels excluded”. Thus the business-class seats on the airline’s A340-500, A380 and 777-300ER jets, along with some 777-200ERs, are laid out in a 1-2-1 configuration and lie fully flat. 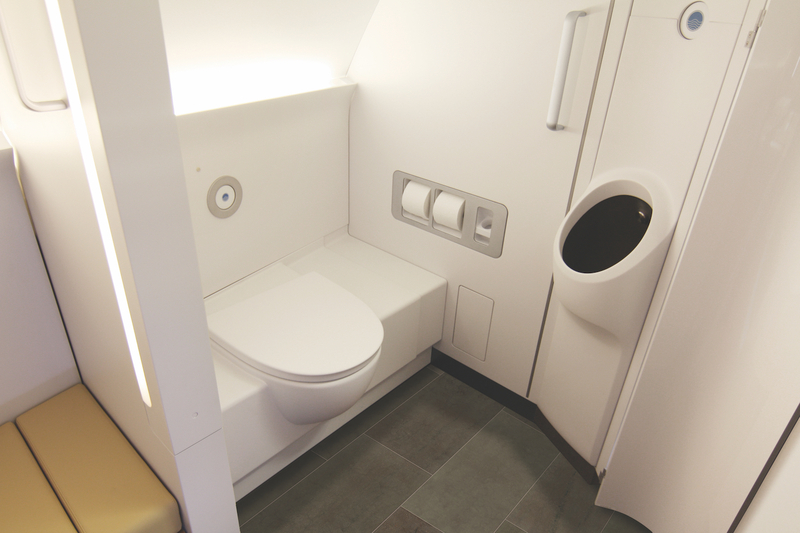 These days aircraft lavatories often include such features as bidets with ‘his and hers’ settings, better lighting and, in forward classes, more room to lay out and apply accoutrements. But lavatories are still “a very constrained location”, he added. An area where airlines can make something out of gender is in the experience of flying, Kolsky states. In-flight entertainment offerings are increasingly micro-targeted “not just to women and men, but to women of a certain age and men of a certain age”, he adds. But amenities “are kind of stuck in time. You’re still getting a lot of the same perks and, frankly, things that nobody uses”. Rather than handing out a prepackaged bag of goodies, airlines could focus on giving something special to each passenger, customised to gender and other factors. Singapore Airlines adds certain touches for women, such as dust bags in the suites and in first class for their handbags,” Ionides notes. According to a survey of over 100 female business travellers relating to inflight meals, 76% of women surveyed feel that airlines are not doing enough to cater to their needs. Website maiden-voyage.com, a business travel network for professional women, and inflightfeed.com, which focuses on pre-order and buy-onboard airline meals, ran an independent survey among professional women around the world to find out what they really want from airline meals. Of the women surveyed, 76% stated that meals were either too heavy in carbohydrates or more suited to men. Of those women flying with airlines that only offer buy-onboard food, only 20% said that they would purchase something and over 40% stated that they pre-plan their meals for their flight. This could be an opportunity for airlines to improve their buy-on-board offerings.